Unless you’ve been living under the proverbial rock, there’s a good chance that you have, by now, become aware of how tragically easy it can be for your online credentials to be stolen. From picking weak combinations of characters that can be easily guessed—it’s somewhat sad that, in 2016, “password” is still the most common passphrase—to reusing the same password across multiple websites, it doesn’t take much to make a mistake that could very well turn out to be fatal. While there is no bulletproof solution to this problem, the easiest way to alleviate it is to engage the services of a password manager—an app designed to provide an encrypted digital vault in which all your different logins are stored. This way, you can use completely different (and highly secure) credentials for each website while only having to remember the one “master password” that unlocks your vault. 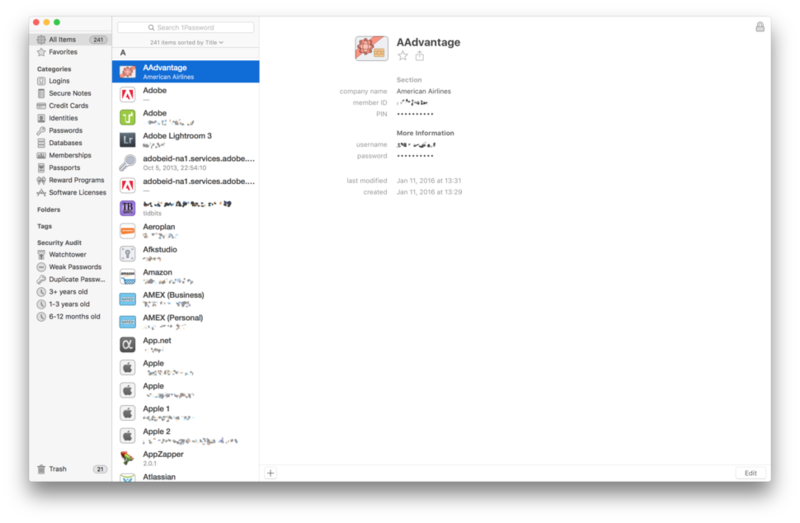 AgileBits’ 1Password (Mac App Store link) is perhaps one of the most venerable members of this family of programs, and one that, with its newest version 6.0 release, aims to retain its position as the leader of the pack. 1Password’s user interface hasn’t changed much—which means that current users won’t have to learn everything from scratch. Curiously for a major release, 1Password’s user interface has remained largely unchanged compared to its predecessor. In fact, if you bought your copy from the Apple Store and you have auto-updating enabled, it’s entirely possible that you may already be running it without even knowing! At the cost of sounding old and crotchety, I must say that this is good news. It’s certainly trendy for apps to undergo drastic UI redesigns with every major release. 1Password has had its share of those in the past, but I happen to think that the current interface works really well. Thus, new users will enjoy a mature experience that has been refined over time, while veterans of AgileBits’s software won’t have to do away with their familiarity and learn how to use the app all over. That’s not to say, of course, that a few tweaks haven’t found their way into 1Password 6. For example, the app now features a redesigned set up workflow, and a new Save Login window now pops up in your browser when you register on a website. This last change, in particular, makes the process of adding new logins to your digital vault more obvious, thus reducing the likelihood that you will forget to save a set of credentials. The lack of flashy UI changes means that the meat of 1Password’s new release lies under its skin, starting with the app’s password generator. 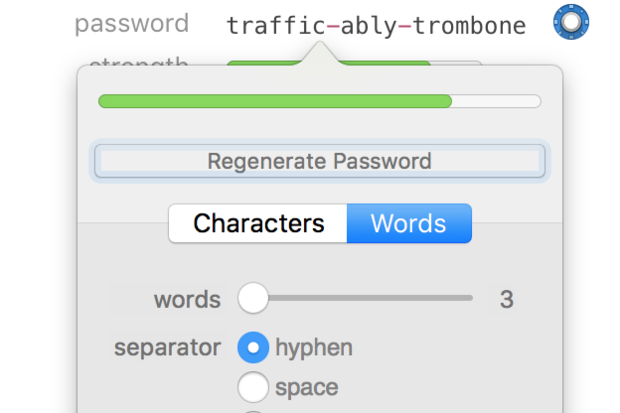 The new password generator can now use words instead of random characters. This nifty feature allows you to create cryptographically-secure passwords based on random data. In the past, this has meant having to deal with really complex sequences of letters and digits like, say, Fmr7M6JwWp. While undoubtedly safe from a mathematical perspective, these tended to be… a little hard to use. Not a big problem if you can use 1Password to both store and automatically fill web forms with them, but definitely less user-friendly if you had to either remember them in your head or type them in by hand. With version 6, the generator can now be used to combine a series of words into passphrases that, while still secure, are much easier to remember and type in. Thus, the old jumble of random characters can now be replaced by a combination of nouns and adjectives that, while just as aleatory, are at least easier to recall and type on a keyboard. 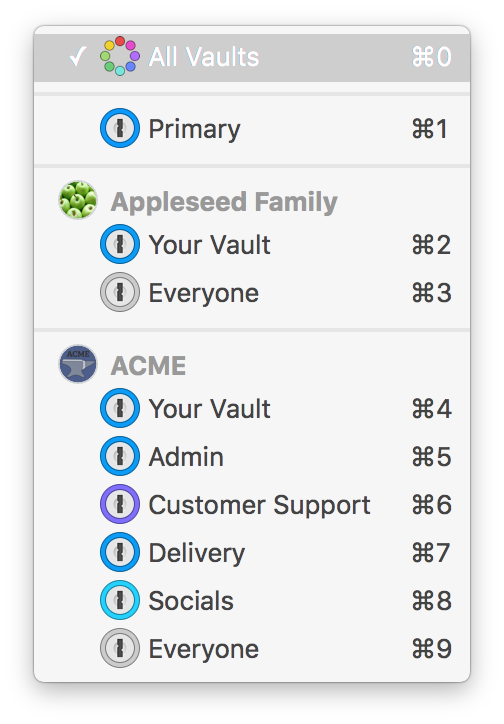 The ability to share a vault among multiple users has been baked into 1Password since version 5. This very convenient feature relies on some external synchronization service like Dropbox to create a vault file that can be accessed simultaneously by different people, and is great, for example, to keep tabs on all your family logins and other private details. Unfortunately, this feature has never worked well for groups of people in which a higher level of control was required: While it’s unlikely that one of your relatives will suddenly resign from your family and join a competing clan, this is a very real possibility in every workplace, for example. The latest release of 1Password gains a brand new feature called 1Password for Teams, which combines the concept of a shared vault with the kind of features you expect in an enterprise settings, like support for multiple users groups, the ability to manage access to secure storage with fine-grained access, and so forth. The product, which is currently in beta and will eventually cost around $5 a month for each user on a team, comes with a few additional perks, such as free access to the professional edition of every version of 1Password, and support for unlimited vaults and storage. The new “all vaults” view brings all the data from your digital vaults together into a single interface. Clearly, the introduction of all these vault-centric changes over the last couple of versions have complicated the lives of those who share their data with family and team members. Luckily, the app now includes an All Vaults view that allows you to work with a merged view of all your data while keeping the contents of each vault physically separate. With the launch of 1Password for Teams, Agile Bits’s business model gets closer to that of its competitors, most of which have switched from one-time purchases to subscription-based revenues over the last few years. Unlike many of its competitors, however, 1Password retains the ability to unlock its more powerful features using a one-time purchase, which feels to me like a smart decision, particularly in light of the fact that the app is compatible with a number of cloud-based synchronization services that most of us are already likely to have access, like Dropbox or iCloud. As a result, the base version of the app remains free, individual users can take full advantage of its advanced functionality in exchange for a reasonable amount of money, and enterprise-level customers enjoy the kind of flexibility they require with a small monthly expenditure. 1Password 6 is an incremental release for a great product. The lack of flashy new features is made up for by a focus on advanced features—and the fact that the upgrade is available as a free update for existing users, either through the App Store or directly from Agile Bits’s online store. While 1Password remains my favorite digital vault, I must say that the product is falling behind its competitors in some aspects; for example, several other password managers now support the ability to automatically change passwords on many popular sites—something that can greatly increase security by reducing the effort it takes to keep all your logins fresh and cryptographically sound, and that is not yet possible with AgileBits’s app. Its great feature set, longevity, and ability to rely on multiple synchronization services, however, still make this app one of the very best of its kind. Here’s to hoping that, now that the folks at Agile Bits have had an opportunity to complete their work on its enterprise features, they will once more turn to improvements that have a more direct impact on helping users get a handle on their digital lives.